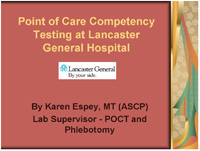 The educational portion of the meeting focused on competency requirements and methods for point of care testing. There were a total of five speakers who presented. Point of Care Manger, Medical City Dallas Hospital, TX. 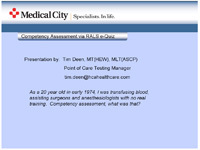 Tim has been in the Medical Technology field for 30 years and utilizes RALS-eQuiz to assess competency of ~1200 operators on multiple analyzers and manual testing procedures. Diana is the POCC at the University of Texas Medical Branch in Galveston, TX. 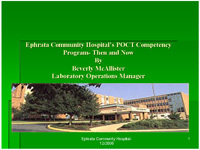 In 2002, AACC awarded Diana the POCT Coordinator of the Year. Diana is part of a two-person POCC team that manages over 2000 users in the POCT program at the UTMB. Diana has developed her own �home grown� online competency tests for various POC tests and online proficiency testing of PPMP using digital images. Her publications have appeared in The Journal of Near-Patient Testing & Technology and ADVANCE for Administrators of the Laboratory. All are welcome. New officers are requested to come. The attendees rated the meeting very high in all regards and had only positive comments about the meeting itself. One constructive comment was that vendors should turn their cell phones off. March 2008 Joint meeting with Baltimore/NJ POCC groups and AACC???? Vendor Fairs � How do we decide which vendors can/should participate? This is usually based upon the topic, but there should be guidelines as to who can participate. We could make it based on sponsorship with those vendors who donate to KEYPOCC for a particular meeting being allowed a display table. 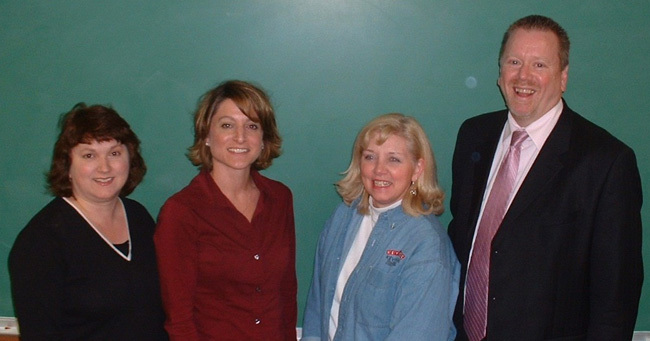 The KEYPOCC BOD will discuss the issue further at the December 19, 2006 meeting. Stacey Cerminaro wanted to remind the group that hosts should always list the sponsors of the meeting on the invitation as an acknowledgment of their contribution.